Does the thought ever creep up? The nagging doubt you’re not good enough? That you don’t have enough clout to make a living online? Becoming an authority would make your life so much easier, wouldn’t it? Clients come knocking on your door. You can choose who you want to work with. You can increase your fees. But in my corporate career, I worked in sales and marketing. I wrote occasionally. But I spent most of my time in meetings. I wasn’t a copywriter. I didn’t see myself as a writer. And I certainly didn’t think anyone would ever hire me to write copy for their website. Almost exactly two years ago, on 28 September 2012, I left my job to start my new life, a life that would be free from corporate stress and boredom. I thought about becoming a content marketing consultant, and I wanted to build an online audience so I could sell information products. But then I got frightened. Content marketing was too big a topic. I didn’t know much about Pinterest or Google Plus. My LinkedIn account was dormant. I wasn’t even on Facebook or Instagram. Learning about all these content marketing tools felt daunting. I didn’t know where to start, and I felt a strong resistance. So I decided to narrow down my focus to writing for the web–a topic I was curious about. When you look at authorities in your field, it’s easy to be impressed by their in-depth and wide-ranging knowledge. Do you feel tempted to emulate their authority and try to learn about everything? The problem is that flimsy posts about wide-ranging topics are a surefire way to kill your authority. Instead, start with a narrow focus for your business and write in-depth posts for your blog. As a social media expert, you might want to focus on Google Plus only. As an interior designer, you could start writing and learning everything about color schemes or textures only. As a content marketing expert, you can focus on strategy and work with others to implement social media campaigns. Gaining in-depth knowledge is easier when you focus on a narrow topic. Becoming known as an authority is easier when you focus, too. And even Google will send you more traffic when your site is focused. You don’t have to stay with a narrow topic forever. You can slowly expand your scope when either you or your audience gets bored. You can’t become an authority by following blogs. Sure, blog posts help you stay up to date, and you can learn a few useful tips. But reading blog posts alone won’t build authority. Real authority requires in-depth knowledge–knowledge you’ll gain by reading serious books, listening to real experts, or gaining hands on experience. Real authority requires you to do the work. To dig deep. To relentlessly focus on improving your knowledge. And then to share your knowledge online. But how do you show that to others? Answer specific questions. Avoid short list posts. Write longer posts that solve specific problems. Quote other authorities in your industry. Ask well-known bloggers or authors for specific quotes, or simply use existing quotes from blogs or books. Show you know what others are talking about. Don’t be afraid to take a contrarian view. Authorities have clear opinions. They’re known for their ideas. And they don’t moderate their views with ifs, buts, and maybes. They tell you how it is without an almost apologetic in my opinion. If you’re concerned about showing a strong view, consider providing an overview of different views and explain why you disagree. Or use quotes of different experts to back up your arguments. Use stats and detailed case studies to write with substance. If you’re a cycling coach, you could use real life examples of how a specific training regime improved performance. Or you can use stats about calories burnt per mile. Details boost credibility and trust. Repeat your ideas. Re-phrase them slightly, use a new metaphor, or different examples. Repetition makes your messages sticky. You don’t think that everyone remembers everything you’ve written, do you? So, repeat your message from time to time. Building an audience is hard work. My favorite method is guest posting. Piggy-backing on a big blog’s audience immediately boosts your authority. But guest posting means you’re building your authority on borrowed land. And you’d like to build an email list with people who read your own blog posts on a regular basis, don’t you? Please note that the percentage of subscribers from social media is unusually high due to the success of my SlideShare presentation 17 Copywriting Do’s and Don’ts (more about this here). The number of email subscribers from guest posts was relatively low as I’ve published fewer guest posts. Kevin Kelly suggests artists only need 1,000 true fans to make a living. I’m not sure such a hard rule exists for running an online business. It depends on your business model. Are a few high-paying clients enough? Or do you want to sell lower-margin products to a large number of customers? I’m not sure how to define a true fan, but I’m sure not every Twitter follower is a fan. Not every Facebook friend is a fan. And not every email subscriber is a true fan. True fans are reading each of your emails–they miss your voice when you’re on vacation. Or they might help you spread your ideas by writing raving book reviews or sharing your post on social media week in week out. Or they’re the first to buy your new products because they believe in what you do. True fans believe in you. They’re groupies. They feel you’re having a positive influence on their life. Do you know how many fans you have? True fans? 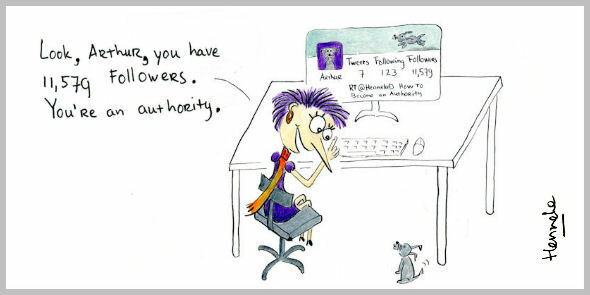 Online authority isn’t about how many Twitter followers or Facebook likes you have. It’s not about how much web traffic you get. And it’s not even about how much you know. Exactly what I’m currently struggling with. I really enjoy reading your articles Henneke. What you’ve done with this article is to inspire me into being an authority on doing business with Africa, because I actually am an authority on why Europe and the United States should start seriously etching their names in the land called Africa. No use putting it at the back of my mind anymore. That sounds good, Dominic. Go for it! Wonderful article. I wish I had read it two years ago when I started writing. I think you did a great job summarizing all the important stuff in just 5 points. I would add just one thing: “Time”. Building your name takes time. One of my most shared articles got popular one year after I wrote it, which looked insane to me. Being patient and constant is also a key point in blogging in my opinion. Do you know why that article became popular a year after publication? Did a big site link to it? Or an influencer share it on social media? Hhaha actually Shanghai got built in a few years. I am still impressed by the rapid growth of its skyline. But yes, back to the point, it takes time. I always wondered why an article that I thought it was useful wasn’t successful at all and sometimes is a matter of many reasons. I’m not sure what it became popular, I got a big site linking it but I also improved the SEO (links, images etc.) and after that more links arrived. If you google “rooftops madrid” my site is #1. From that moment on, I’m careful with titles (thanks to your posts ;), links and other things that do matter as you said previously. On the other hand, I am patient. Some other articles are becoming more popular after one year. I know Google has a lot to do with that popularity but in the end, is the “loyal community” that matters. I was in Shanghai in 1992. At that time they had more cranes than any other city in the world. I probably wouldn’t recognize it now. Yes, I agree with you – the loyal community matters, and Google will eventually follow. Thank you Henneke for your spot-on suggestions (although I do not have a personal blog myself, they’re sure useful) and for the discovery of Virginia Duran’s work. I started following her blog and her Instagram account five minutes ago! Thank you for your fantastic work, Henneke. Great post as usual Henneke. I agree with Virginia about time being an important factor. A serious online presence is not likely going to work for the weekend warriors out there. Online authority means using a business approach and staying the course. Thanks again for your valuable content. Yes – you’re right, Barry. You need to take a business approach; and building authority is harder as a side-project on top of another job. I think it’s possible (especially if you focus on something you love doing), but requires grit and determination, and a longer time frame. This is something I’m struggling with, so this post is perfect. It’s really hard to pick something super specific sometimes. Do you recommend going with what makes us curious? Yes, go for something that makes you curious. When you’re curious, you tend to dig deeper to learn more, and then you have more knowledge to share. And you’re probably also more enthusiastic which will shine through in your writing. Building authority is hard work, so if you choose a topic mainly because you think it’ll be profitable, then it’ll be hard to keep going. Of course, you shouldn’t go for a topic that’s so niche that only 3 people in the world are interested, but I’d say it’s hard to pick such a topic. You can’t always plan ahead and know what you’ll find interesting until you try. So try not to overthink it too much (I know, I know, much easier said than done). I’m so happy I was able to inspire the idea for this blog post as you’ve defined some really helpful steps here 🙂 I was listening to an interview with Pat Flynn from Smart Passive Income recently and his definition of being an authority is that as soon as you know more about something than someone else, you can be considered an authority to them. And like you said, you don’t start out as a world-renowned authority, but over time, as you continue to educate yourself on the topic, you really do become an authority. Another way to prove to yourself that you are becoming an authority is when you attend a conference or join a forum and can share information with others that they are grateful to hear. I’d bet that all of us are authorities on SOMETHING but we’re just too humble or shy to admit it. Yes, you point out an important point – you only have to be an authority for your own tribe, not for everyone else. You don’t need to become world-renowned (unless you desperately want to). Another very useful post. Just wanted to comment on how interesting it is that different things stick out of any article for different people. In this case I thought much of your article was about things taking time – as in ‘no quick win exists’. And the comments from Virginia were great example of that. We pick out what we need from where we’re at it seems. And yes, I’ve noticed this, too, that different people pick up different things from a post. It’s the same when I re-read a book a year or two later – I notice things that didn’t stand out the first time I read it; and sometimes it feels like I’ve missed the most important points during the first reading. Thank you for this post and for sharing Kevin Kelly’s article, Henneke. Building online authority boils down to connecting and engaging with your readers, whether that’s by solving a problem (as you emphasized) or sharing content and ideas that inspire or enlighten them. I have a topic suggestion that could serve as a follow-up to your post: we all know that to build your online authority means taking the time to connect with your audience, to get to know them and their needs. How do you handle audience members whose goal is just to pick your brain and know your “secrets”? Thank you, Stef. I’m happy to answer specific questions, so if people struggle with something specific (like: how to become less verbose or how to make content more conversational), then I’m happy to answer the question or refer people to a blog post I’ve written about the topic. However, if the question is unspecific (like: can you have a look at my website or can we set up a call to discuss my business), then I usually politely decline, because it becomes too time-consuming to do for free. I find it hard to decline, but I’ve learned that I have to be careful with my time and my energy. Specific questions, however, are great because they help me understand what readers are struggling with and give me ideas for writing more blog posts. Hey Henneke and thanks for taking the time to share your thoughts about this! I feel relieved that I’ve only turned down people who fall under the latter category. I agree that time and energy are valuable and we should be smart about how we spend it. In fact, I’d say it’s almost as valuable as the money you spend on your business! Or perhaps our time is even more valuable than the money we spend on our business? I particularly like the advice to stop reading blog posts! Oops. Now you point this out to me, I wonder whether it’s dangerous advice. Will I still have any readers left next week? Thank you for stopping by, Terry. I came to know you by your guest post and started to read every email of yours ever since. Somehow you feel like an unmet friend. Oh, BTW, I am still studying your book chapter by chapter. Thank you very much for sharing. And glad you’re enjoying my book! I love your posts even if it means I’m taking precious time out of my day to read blog posts. 🙂 I specifically appreciated how you laid out step 3 – gave a me a great idea for my post today. Your “stop reading blog posts” tip certainly won’t stop most of YOUR fans from showing up here. I get what you mean though, that there comes a point at which you must move beyond the superficial and get down to the hard work of building your business. Thanks! Glad the message came across in the right way. I’d hate to be chasing everyone away from here! Always lovely to “see” you here, Melinda. Truly great post that really spoke to me. I especially like step 2 because that’s something I’ve been contemplating doing. I want to be a better blogger – an authority some day – and I know that I can’t do that solely on reading other blogs. I have to take time to really study, improve my knowledge and listen to established experts and that’s what I’ve started doing. I’m following their blogs much more closely now and commenting and taking notes. That step alone is gold. Also, in regards to building an audience, I’m choosing guest posting as well. I’ve guest posted twice so far and I’ll have my 3rd come out later this month. But while I’ve been able to get a few subscribers here and there from it, the numbers aren’t staggering. 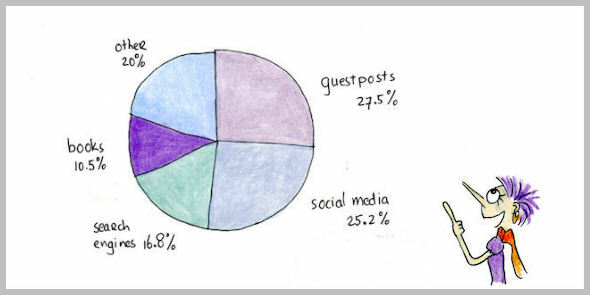 To use guest posting as an effective strategy, do you think that a person has to guest post more than just once a month? Great post once again. Hope you have an awesome upcoming weekend. Hey Andrew – sounds like you’re on the right track to establish yourself as an authority! * The blog post – sometimes a blog post just doesn’t work – it happens sometimes. The number of guest posts really depends on what you can cope with – some months I write 4 and in others nothing. I’m currently probably averaging just over 1 per month, but last year I wrote probably over 2.5 per month on average. Hope you’ll have a good weekend, too! Regarding the true fans statistic: I have a hobby in the event management field. We have just 730 likes on Facebook, 300 email subscribers and maybe 200-300 people in other social networks. But out of all that “crowd” there are only 35-50 people, who really come to my events (true fans). So the conversion rate is below 5%. I was wondering what the percentage would be but couldn’t make up my mind. I was guessing that maybe 1% or 2% of my list might be true fans, but it might even be lower than that (I have just over 5,000 email subscribers). So, I’d say that 5% is great (it’s also true that smaller communities tend to be more engaged). I’d say you’re doing well, Eugene. Thank you for stopping by! I could not agree more about not reading blog posts as a way to learn. I have read hundreds if not thousands of posts on many online marketing topics, and the majority of them are simply too shallow to be of any use. My biggest wins have been from doing practical things in real life and making painful mistakes, from networking with real experts and from reading books. Yes, making mistakes is one of the best ways to learn – that’s an excellent point. Some things can only be learned by trial and error. Especially when working online, there are so many different things to consider, that it’s impossible to get everything right first time, so it’s a continuous process of improvement. Thank you for stopping by to add your thoughts. I appreciate it! Your post was so timely and absolutely perfect for me! I am on the verge of focusing my freelancing efforts into writing online copy….I say verge mainly because of what you have discussed here. I have tons of professional experience in other areas but only recently decided to focus my freelance efforts in this one area (where I am a newbie but in love with the process). But battling my fear has absolutely been holding me back. Thanks for this article! I absolutely just need to get over myself, keep studying and moving forward! It really helped to read something from someone with a similar background who has been successful in that transition! Don’t underestimate the value of other professional experience. I was a newbie as copywriter, and didn’t realize how useful my general business and marketing experience was. Go for it! Let me know if there’s anything I can do to help? Thank you for stopping by, Stacey. Thanks so much for the response Henneke! Yes, focus is important. I didn’t spend a lot of time on social media (I’m still not on Facebook! ), but I did spend a lot of time reading books about copywriting. I tried to approach it as a learning project, making notes and summarizing what I learned. Those summaries turned into blog posts. Sometimes it’s better to re-read a book rather than read another book. I also spent a lot of time analyzing web copy and blog posts to figure out why I liked the content and why it seemed persuasive (or why it didn’t work). I came back to this one from the back link in your LinkedIn mega post, which I loved! I continue to have the same problem — too much reading and not enough writing. I’m researching myself to the poor house! I think I need more discipline and to narrow down the list of authorities I follow to a precious few. And no worries for you, you’ll always be on my short list! It’s a challenge to get over this feeling that we don’t know enough. What has also helped me is to decide which topics aren’t important for me at the moment. For instance, I ignore almost every content about how to do better on social media because I don’t have enough time to do better on social media; and I ignore everything about Facebook, Instagram, Snapchat etc because I’m not present in these channels. I’ve also found that I when I start writing I know more than I think. A blog post doesn’t need to cover all angles, all details, and all arguments – that would overwhelm readers, but also me as a writer. So I write what I know so far. And then I might get back to the same topic in the future and write about it again in more depth or from a different angle. What surprises me is how much I learn by writing. It’s true that writing helps clarify our thoughts. We all know more than we think. Somehow our brains are wired to focus on what we don’t know yet.